GUELPH, Ontario – Have you ever wondered what a career in policing could be like? YEP is a free interactive and informative after-school program, which gives students in grades 10 to 12+ the opportunity to learn about policing. The program runs every Tuesday night from Sept. 17 to Dec. 3, 2019. Youth in the program will learn about the Guelph Police’s Forensic Unit, Tactical Response and K9 Unit, Drug Unit, Traffic Services Unit, and more. Students in the program also earn 20 community service hours, have the chance to build their resume and network, and get an overview of future career opportunities in policing. 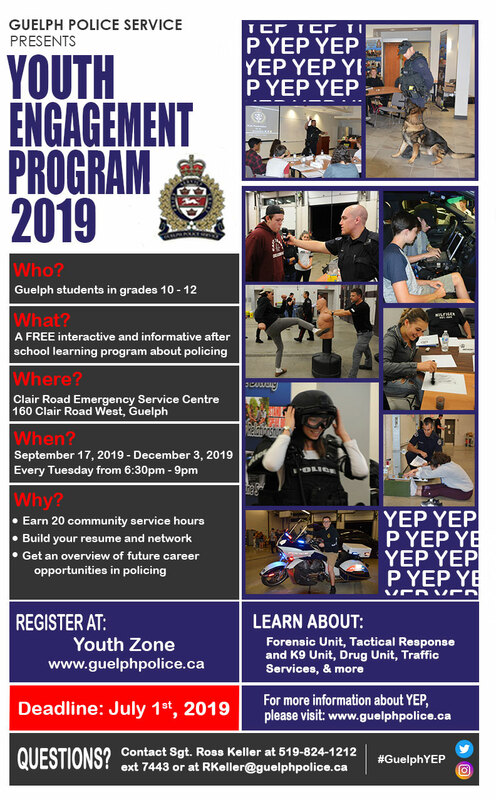 To register, submit an application online at http://www.guelphpolice.ca/en/Youth-Zone.asp by July 1, 2019. For more information, please contact Sgt. Ross Keller at 519-824-1212 ext. 7443 or at RKeller@guelphpolice.ca.